Collection of many different natural gemstones. Stock Image macro. In the wise words of Marilyn Monroe, "diamonds are a girl's best friend" -- but are they? Ok, probably yes -- but they aren't the be-all and end-all when it comes to jewellery. Though diamonds are traditionally the favourite for engagement rings, other precious stones are starting to gain in popularity across a range of jewellery, rings included, as purchasers start to experiment with colour and design. Advances in technology have also impacted diamond demand. Recently, president of the the World Federation of Diamond Bourses told a conference the industry had fallen behind the times because it was not keeping up with trends -- notably with the hottest selling watches like the Apple Watch now having touchscreens, rather than diamond-encrusted faces. “Have you ever heard of a 20-year-old standing outside a store all night to buy jewellery?” he asked, referring to the buzz surrounding Apple product launches. So concerned is the Federation regarding the downturn in demand, it is looking to emerging markets in Russia and Asia to boost the sale of diamonds for jewellery. The trend is likewise reflected here in Australia, with gemmologist and jeweller Matthew Ely telling The Huffington Post Australia consumers are branching out even when it comes to engagement rings. "I’m seeing some coloured gems definitely coming through in terms of popularity, even though the diamond is that classic purchase," Ely said. "You can’t go too far wrong with a diamond, but making it slightly unique in your own way, by issuing a colour with it perhaps." Ely notes demand for both coloured diamonds and gemstones is on the rise, stating "there aren't necessarily any rules now." "I'm seeing people go right through to the other end of the spectrum, who want something left of centre and will pick whatever gemstone they prefer," Ely said. "Opal through to pearls to sapphires -- just not long ago I made a really beautiful aquamarine [engagement ring], which was quite a statement piece." Popular colours include ocean-y tones of green and blue as well as paler pinks and blushes. "One of the nice ones I did recently was a paraiba tourmaline. This guy wanted something truly unique, that people wouldn’t have seen before. He didn’t want to go for a diamond because it’s so straight down the line," Ely said. "This is one of the most expensive tourmalines you can come across because of its rarity -- it's this tropical type of ocean colour -- and just has incredible colours. "It is a step up on an aquamarine in terms of it being exceptionally expensive and beautiful at the same time." With rose gold also being very fashionable at the moment, Ely says the demand for softer-hued stones has increased. "Pink diamonds and pink sapphires are popular at the moment, though I suspect pink sapphires are a spin-off due to pink diamonds being out of reach," Ely told HuffPost Australia. "By that I mean people not being able to get the size they want. Pink diamonds don’t exist in certain sizes that aren’t tens of millions... as much as we’d all love one like J-Lo’s, sometimes a pink sapphire is the more practical choice. "Morganites are a soft pink or peach and we’ve had great success with those because of the soft tones -- they really compliments diamonds and rose golds, which is one of those metals everyone is in love with right now." A faceted oval morganite from Brazil, weighing 47.23 carats, next to specimen of morganite rough. 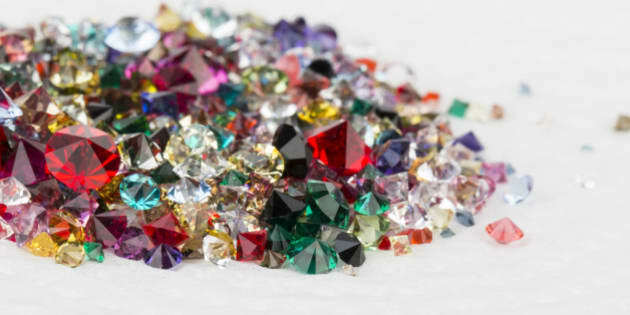 But sometimes it's not all about the bling, with Ely telling HuffPost Australia people occasionally have gemstones which may hold a certain significance to them "hidden" within a piece of jewellery. "It's good fun to play with the concept," Ely said. "I've made rings with hidden gemstones underneath. It adds colour to the engagement ring, and it's a slightly more subtle way to make a piece unique. "For instance if your birthstone is a ruby or a sapphire, you can hide these gemstones in the side or underneath -- it's kind of a secret that's special for the couple but also timeless because of the diamond. "It's all about reading the personality of the client and working out something that's going to excite them." However, those thinking about purchasing a precious gemstone for their significant other should do their research before handing over their money. "The difficult part with gemstones is they’re not as governed as much as diamonds are," Ely said. "Buying those expensive gems, you need to make sure you're buying something from a particular locality and not something just next to it. "For instance, a ruby from Burma as opposed to a ruby from Thailand -- telling the difference as a normal person would be quite difficult. "Even as a professional looking for inclusions is hard, but the difference in price can be 30 - 40 percent. "You want to know what you’re buying and trust who you are buying from. Things can come unstuck prettily easy when it comes to gemstones if you’re not in the know."